That’s it; I’ve had it. I’m buying the $3.99 tulips from Sobeys. I’ve managed to stay fairly optimistic about this never-ending winter in Calgary… until now. The April 14th snowstorm was the last straw and today I woke up to more snow. I am now wondering if the tulips in my garden are going to survive this. Last year they were partway up on March 29th, and I’ve been waiting and waiting to paint them. Yesterday I broke down and bought some tulips, and at 10:30 last night I decided to set up a still life. I was looking at my still life and thinking that I may not get to paint it until Tuesday since we are having company tonight and I work tomorrow. Then I thought, “it’s perfect right now, just paint it now.” I worked until 2 am (that’s when I took the photo at left). It was fantastic! The painting wasn’t quite finished, but there wasn’t much left to do today: mostly detail in the leaves, flowers and vase. Here is the finished painting, which is now my favourite still life painting EVER! That is, until I do my next painting. I see now why I did not get into the shows I applied to—it was a bit premature before, but I’m still glad I applied. Now I can get on with making a good body of work and apply again. ← The Gravatar was right! Dayna,It’s looking fab. I love it! Looking forward to all that spring will bring to your work. I’ve always loved your still life paintings, and this is no exception. Yes, I am SO looking forward to spring this year! i love all the different shades of orange! 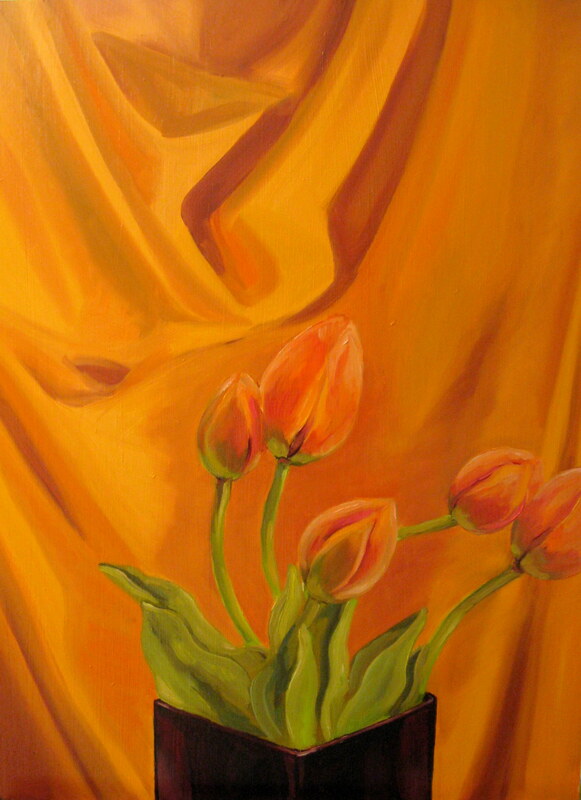 But i gotta say, this only comes second in my heart to my two tulip paintings in my staircase. Altho this one also has a great story behind it . . . Thanks Pick! 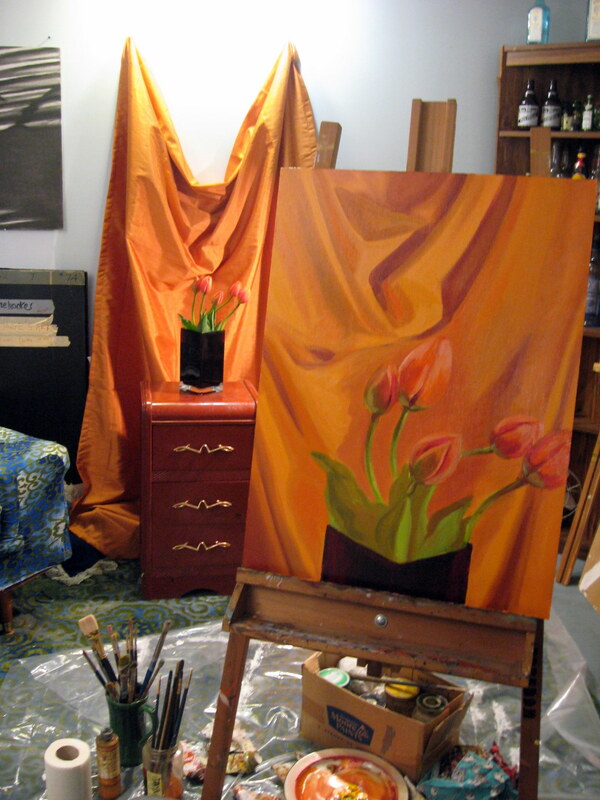 I love taking “studio shots” of my paintings and their respective still lifes. Maybe one day I will compile them all together.